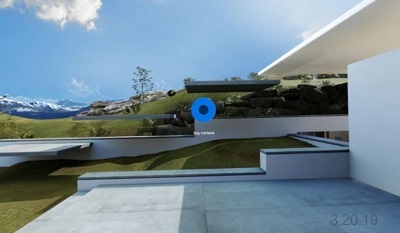 A new patent from Microsoft sheds light on improvements for the audio system for devices emulating an augmented reality. 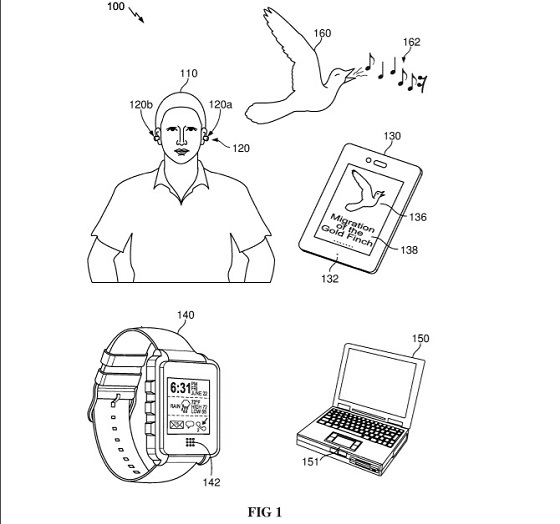 First spotted by us, the patent simply titled ‘Audio augmented reality system’ was published by USPTO on March 19, 2019, and filed by Microsoft in 2018. In the patent application, techniques to enhance the performance of audio augmented reality systems have been described. “Techniques for online information search and retrieval for a query including a digital audio waveform. In an aspect, an audio waveform is received and digitized by at least one of a plurality of audio input devices. The digitized audio waveforms are transmitted to a central processing unit, which formulates and submits a query to an online engine,” Microsoft explains. “The formulated query may include at least one digital audio waveform. The online engine retrieves one or more online results relevant to the formulated query. The online results may include one or more relevant visual results, and/or one or more relevant audio results. The retrieved results are served in real-time back to a user, via a device having audio output capability, and/or a device having visual data output capability,” the company adds. The foldable devices are in vogue this year. Companies like Samsung and Huawei have recently unveiled their foldable display mobile devices. Microsoft is also said to be working on its own foldable device and a new version of Windows optimized for such form factors. A new patent from Microsoft has revealed the possible design of a dual-screen tablet-sized device that would apparently run Windows 10. The patent application shows off a booklet form factor device with two displays and a hinge assembly keeping the two sides joined. First spotted by us, the patent simply titled ‘Hinged device’ was filed by Microsoft way back in late 2015 and just published by USPTO on March 12, 2019. 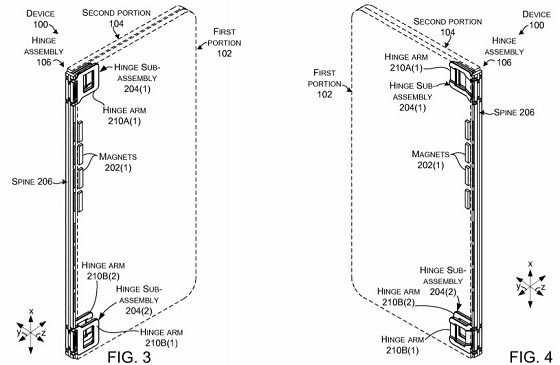 In the patent application, Microsoft inventors have described a device comprising of two portions with hinge ends. There is a hinge assembly secured to the hinge ends of the first portion and the second portion to allow the device to change its form factor. It also uses magnets to keep the two sides assembled together and the device even supports 360-degree rotation. “The description relates to devices, such as computing devices that have hinged portions. One example can include a first portion and a second portion. 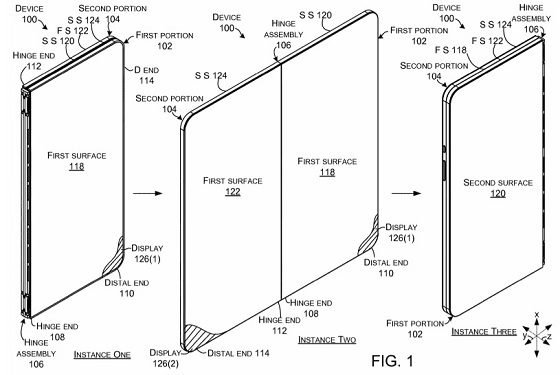 This example can also include a hinge assembly and a magnetic assembly,” Microsoft explains. “The hinge assembly can rotatably secure the first portion to the second portion. The magnetic assembly can be positioned relative to the hinge assembly and the first and second portions that bias the first and second portions to a closed position where the first and second portions overlay one another and to an open position where the first and second portions are juxtaposed and coplanar,” Microsoft adds.